Do Fish Really Like Eating Earthworms? Bon-hwa S. asks: Worms drown in the water, so how do fish know they are food? Is the reason they like them just the movement? Thanks! Worms, or more specifically earthworms which are by far what most people mean when they use the term “worms” in the fishing scenario, don’t live in water. In fact, the reason you see so many on the ground during heavy rains is because, when stuck in soil that is too wet, they can’t breathe properly and must come up for air, despite the extreme risks to their lives in doing so. You see, while earthworms don’t have lungs, they do need oxygen and acquire it through their skin. During heavy rains, the high water content of the soil doesn’t allow gases to diffuse across their skin. Thus, they must brave the surface world or die. Back to fish: if you went to a random lake somewhere in the world, the odds that the fish living there have encountered an earthworm are pretty small. Sure, storms are bound to wash some worms into lakes and ponds every now and again and there are fisherman who catch and release that use worms as bait (though one would think this would make a fish less likely to want to eat a worm), but for the most part, earthworms aren’t something fish ever encounter naturally. So why is this the go-to bait used to catch a fish? As it turns out, while it’s true fish are unlikely to encounter an earthworm in their lifetime, they are quite likely to encounter something that sort of looks like one. Further, many fish really aren’t that picky about what they eat. For example, a catfish will happily eat dead bugs, plants, snails, fish eggs and even other fish; more pertinently, they will also eat things like leeches and insect larvae, both of which you could argue look kind of like earthworms. Catfish will also eat things like aquatic worms, which are somewhat similar to earthworms, though are their own distinct species. All that said, with bait, you don’t want to present just any old food source, you want to present the preferred food source of the thing you’re trying to catch. And, as any experienced fisherman will tell you, fish are mostly attracted to bait for two reasons: smell and movement, with different fish being more attracted to some baits than others. For example, ocean dwelling fish (or at least the ocean dwelling fish people commonly want to catch) mostly feed on smaller fish or carrion. As such, cut bait (cut up pieces of fish) is usually recommended because the scent of blood (generally) carries better through the ocean and will get you a better response than movement. In lakes and ponds, however, where the main diet of fish is a little more varied, your options for bait are a bit more open. For example, fish in lakes are just as happy to eat insects that fall into the water as they are to eat bits of dead plant. So you can happily fish using things like crickets, bees and even bread if you really want to. You can even buy special paste that you can rub on bait and lures to make them smell more delicious to certain species of fish. You can also forgo bait entirely and just use lures that look like bait and jiggle around in the water, or find lures that are designed to skip along the surface of the water and catch fish by tricking them into thinking they’re a small insect or something. With all this in mind, you might be inclined to think that it’s not that fish like earthworms inherently, it’s more that they’ll eat anything and earthworms are a good all round substitute because, before they succumb to suffocation in the water, they wiggle around a lot (perhaps even more so because they’re suffocating and, of course, have a hook jammed through the body). Fish love movement and, anecdotally, most fisherman will tell you you’ll catch a lot more fish with a live worm than a dead one. So this seems reasonable enough. And, who knows, perhaps the fish even like the scent. That said, it turns out, neither of those things seem necessary, at least with bass, though much more research needs done to determine this more definitively. You see, in an experiment conducted by the Berkley Fish Research Center, bass that had literally never seen a worm, or anything that looked like a worm (or any other prey for that matter) in their entire lives were put into special tanks where researchers dangled bits of plastic that looked like the food they had been given all their lives. The response was lackluster. The fish just weren’t that interested in plastic versions of their normal food. The researchers then dangled plastic that looked like a worm. To the researchers’ surprise, the bass reacted very strongly to lures shaped like worms. And here’s the most interesting part, they did so even when the worm-shaped plastic was completely still. In the end, it was discovered that the bass were a whopping 10 times more likely to try to eat plastic lures shaped like worms over the plastic lures shaped like their normal food. The researchers couldn’t come up with a reason to explain this behaviour, especially considered the fish still loved the worm-shaped, scentless, plastic when it was motionless. Was it because they are just naturally curious, seeing a completely new object and having the built in reflex to see if it’s edible? Was it because it’s hard-wired into their brains for some reason to want to eat worm-shaped objects? Who knows? It remains an interesting footnote until more research is done. This also brings up the question of whether the same thing carries over to other fish. We don’t know. But at least one type of fish really do seem to like things that look like earthworms. 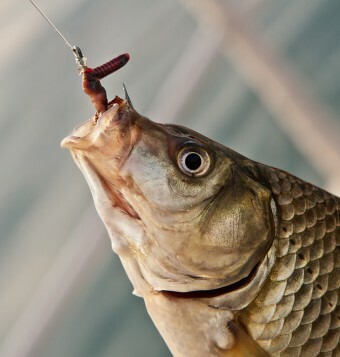 Although fish don’t normally encounter earthworms in their day-to-day life, they are undeniably one of the best and most versatile fishing baits you can buy. For example, an earthworm known as the European Nightcrawler is so hardy it can be used in both salt and fresh water and is one of only a few live baits that won’t die right away when put into freezing water and will also last some time despite having had a hook run through part of its body. Why do bass eat plastic worms? I always wondered why do my cats go crazy when I open a tuna can. They have never been to the ocean so how do they know they like it? Id love to know which fish they asked?